Custom painted home portraits are another aspect of my art business. If you are in the Raleigh, NC area, I can take reference photos of your home plus consult with you about which aspects of your house make it your home. For clients outside the Raleigh area, I can work from clear reference photos you may email to me. Sometimes I will draw a preliminary lay-out and email the client the rough draft to be sure we are on track before I begin the painting. 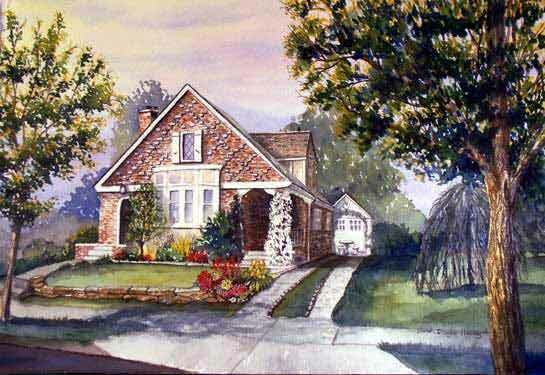 All home portraits are done in watercolor on acid-free 300# watercolor paper. They are placed in a presentation mat. The client can then take the painting to their own framers. Please contact me for quotes and any other questions you may have about home portraits. My Art Lessons Listed in Article in Today’s Newspaper!